Just like its quartet of characters do every episode in building a mission out of a classical musical composition combined with a work of art, the successful Playhouse Disney series Little Einsteins has evolved from a rather brainy blend as well. Laying the groundwork via its six years in a row winning children's predecessor Baby Einstein and augmenting it with a television crew that included the co-creator of Dora the Explorer, the toddler friendly version of the baby model that began with a direct-to-video title has garnered international attention. Following its Tokyo debut, the series, which centers on four precocious tots aged three to six who travel the world, has echoed its global missions by finding a fan-base in the UK, Australia, Asia, and the rest of Europe. And fittingly, in the latest adventure that's hit shelves from Walt Disney Home Entertainment, Annie, June, Quincy, Leo and his trusty Rocket embark on four wild Animal Expeditions that take them everywhere from the whale populated ocean to duck populated Great Lakes in the disc's standout to Sydney Australia's Opera House and Jaipur, India's Big Elephant Festival. Throughout the series uses the music of Mozart, Grieg and Bizet along with authentic aboriginal art and paintings by Seurat to serve as the backdrop and stage-setter for all four endeavors. Vividly animated to the point that the tiny characters nearly pop off the screen especially when juxtaposed next to live action footage, the episodes which are jam-packed with informative data prove to be even more intellectually engaging to toddlers than Diseny's own Mickey Mouse Clubhouse. 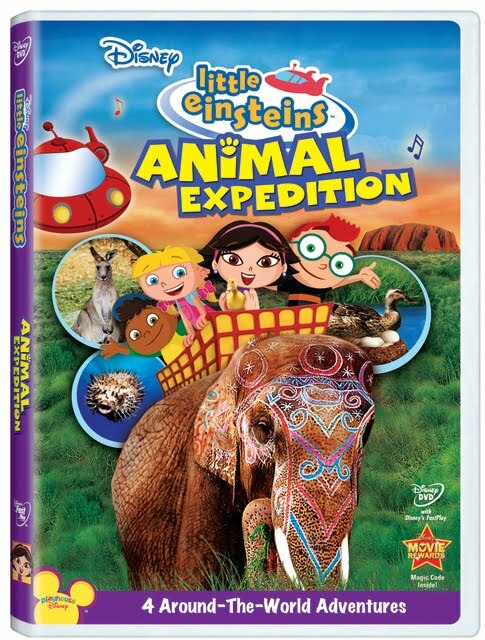 However, while Einstein, like Clubhouse and Handy Manny can be viewed solo as well, in the case of the little kids of Einstein with the great big brains and hearts, adult supervision and/or parental involvement is especially recommended since the interactive degree of difficulty in repeating six syllable musical directional terms is something that would benefit from being shared together. Of course you can always just view the titles of “Whale Tale,” “Duck, Duck, June,” “Jump for Joey,” and “Little Einstein's Elephant Parade,” passively as some of the interactive questions and skills called upon like patting your knees to build up enough power and stamina for the children's Rocket are on par with queries from Mickey and Toodles in the Clubhouse. However, this being said, it's much more meaningful to talk about the painting by Seurat or discuss why the duck needs to follow its mom instead of a stranger with a parent instead of the stranger of a DVD player. Admittedly, plot-wise, adults and older children will feel less involved with the works than during a typical episode of Handy Manny or some of Nickelodeon's animated series like SpongeBob Squarepants. Yet despite this, the engaging sensory experience of Einstein is certainly worth bringing home to see what your babies turned Little scholars will think once the novelty of the Expedition wears off and the facts of each mission begin to sink in.